Recently I bought three pieces of 10 pt type cast at the Gutenberg Museum in Mainz. 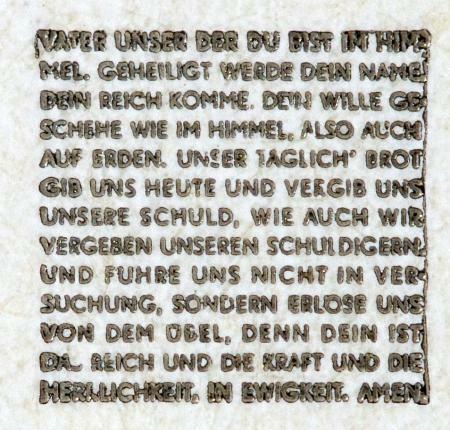 On each is a 13 line German version of the Lord’s Prayer. Can you suggest the best way to enlarge the image. I have printed it on gloss paper and have had it suggested I use my digital camera and enlarge it in stages.i.e. print the first enlargement and photo that etc. Would like to get up to a readable image - about an inch square. Pull a clean print on a slick, scan and enlarge at will. If you scan as Tiff and have it vectorized by an online service, you should be fine to go as large as you desire. If you know it’s the Lord’s Prayer, you don’t really need to bother to print it in order to read it! Normally they sell them with a printed version! 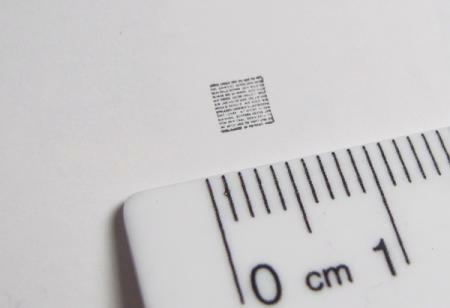 i would think putting ink on something that fine would only clog it up, it would print a nice square. Here’s an example of it printed. One of the hot metal to photomechanical conversion methods came from Ludlow. The form was sprayed with black, then the surface milled for a bright metal image, then photographed onto film. I suspect something purely photographic will give you better detail than using a printed intermediate stage unless you have real repro paper (like Ruling Relyon or even better, ScotchPrint) and a good proof press. Modern coated stock just does not compare to repro paper. >One of the hot metal to photomechanical conversion methods came from Ludlow. I did a LOT of Brightype in my first few years; what a dirty job that was. You finished the day looking like coal miner.